I think I’ve found the one. For my final workout this Sunday, I chose a new class at a new studio, taught by a familiar face. All of my instructors have been far kinder than the SoCal drill sergeant who turned me off from yoga seven years ago. But I especially liked Jacque, a native of Dallas, Texas, with a laissez-faire style who teaches at both Sangha Studio — where I'd been earlier this week — and All Wellness, a physical therapy and Pilates studio in Burlington. We signed up for a 10:15 a.m. class at All Wellness, located in the Innovation Center on Lakeside Avenue. In the magenta-walled entry, Jane Fonda’s Workout Record sits on one shelf — the album cover shows the former fitness star wearing a striped leotard, beaming as she holds her leg at an impossible angle. 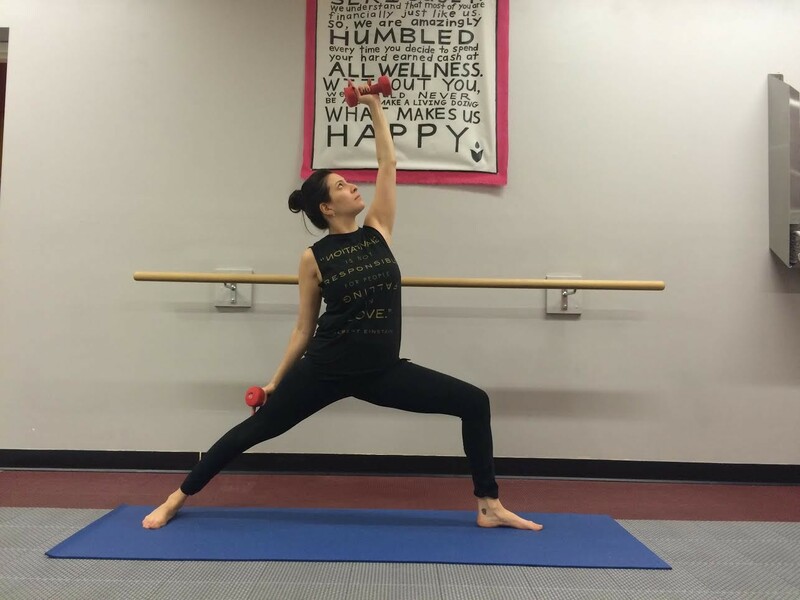 Jacque’s Yoga Sculpt class (tagline: “When muscle meets yoga”) has the aerobic intensity of a Fonda routine. Fortunately, it doesn’t involve high-cut leotards and high-knee dance moves. It does involve weights. Before class, each person selected two sets, which ranged from three pounds to 10. I optimistically chose pairs of five and eight pounds. The latter would remain untouched. The workout began with simple stretches and downward dogs, but things escalated as soon as we picked up the weights. Jacque led us though an arm-burning series of squats, burpees, lunges and exercises I can’t name. With all the planks, crunches and bicycle kicks, our abs were not overlooked, either. I had no idea it was possible to get such a good workout within the confines of a 6-by-2-foot mat. It fulfilled two needs for me — loosening tight muscles and raising my heart rate. The uptempo music (think “Work” by Rihanna) and ample encouragement from Jacque (“Beautiful, everyone!”) distracted me from my discomfort. Though my boyfriend complained afterward that he would be cripplingly sore tomorrow, I’m pretty sure he liked it, too. Vermont Yoga Week, sponsored by Seven Days, was February 22-28.